Over the two-month internship, the students not only conducted research projects, but also assisted with general maintenance of the ASCC-CNR nurseries and greenhouses, and with the daily feeding and other duties at the piggery and chicken coop. 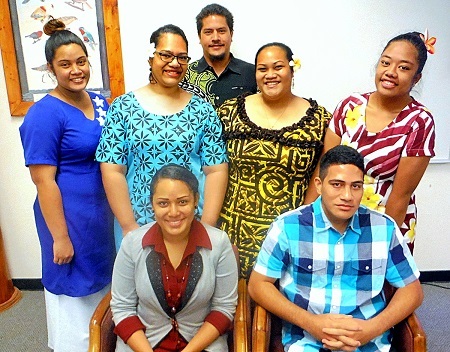 They also worked alongside faculty and staff hosting the Insular Areas internship program in early June, attended by student interns from Guam, Virgin Islands, Marshall Islands and Pohnpei, followed by the STEP-UP Summer Institute, attended by promising Science students from the local high schools, which took place from mid-June through most of July. “The interns not only gained the experience of conducting research, but were also able to develop communication and job skills and network with the professional and technical staff,” said Mrs. Tuitele-McFall. For the conclusion of their internship, the students gave presentations on areas of research currently of interest to ASCC-CNR. With instructor Dr. Otto Hansell as their mentor, Jennet Chang and Marlena Vailolo researched "Methods to Control/Prevent Myna Birds from Inhabiting/Feeding in the CNR Piggery Unit." Also working with Dr. Hansell, Kolona Fotu and June Talamoni chose to investigate “Methods to Control/Prevent Soil Erosion at the ASCC-CNR Poultry Unit.” Fatima Aneki and Ikenasio Sagaga pursued the comparative study “Leaves Palatability Feeding Trials for Swine Using Pele, Lopa and Manioka Leaves,” with Dr. Hansel again serving as a mentor. ASCC graduate Faatali Fai’ai, currently majoring in Tropical Agriculture at UH Hilo, worked with ASCC-CNR Horticulturalist Mr. Ian Gurr as her mentor on her project “Utilizing Locally Sourced Organic Materials to Produce an Alternative Medium for Growing Vegetable Seedling Transplants.” Elenoa Taisali, also an ASCC graduate now majoring in Tropical Plant Science & Agroecology at UH Hilo, worked with current ASCC student Chastity Tuiolosega to study “DBH Measurements of Norfolk Pine Tress at ASCC-CNR,” with instructor Mr. Ionatana Fasavalu mentoring. “Faatali and Elenoa are both ASCC alumni now pursuing advanced studies in the Agriculture field,” explained Mrs. Tuitele McFall. “They contacted us early in the year to express an interest in our summer internship program, and since we try to support local residents in their Agriculture careers, we decided to accept them along with the current ASCC students. For more information on the CNR Summer Institute Program, contact Mrs. Tuitele-McFall at 699-1575.